Tom Connolly’s dazzling second novel is a funny, turbulent, and heartfelt study of male relationships, and a glorious love letter to the city of New York. It is April in Manhattan and the destinies of four very different men are about to collide. Nineteen-year-old Finn has just arrived in the city with his irrepressible and volatile girlfriend, Dilly, determined to even the score with his older brother Jack for abandoning him in the UK in the aftermath of their parents’ deaths. Across town, successful gallery owner Leo Emerson is haunted by loneliness, unsettled by the contrast between his life and that of his brother-in-law and oldest friend William, who is enviably contented in his faith and his marriage. When Finn wanders into Leo’s gallery, a series of unexpected and interconnected events unfold, changing the lives of all four men, for better or worse. Leo and William’s settled existences are overturned by events outside of their control, while Jack and Finn’s complex relationship reaches its long overdue showdown. Beautifully orchestrated and richly comic, Men Like Air explores the romance and solitude of cosmopolitan life, the transformative power of art, and the impact we have on one another’s lives—and what happens when the ties that bind us are tested or broken. It is an intense and uplifting story of growth and renewal, mapping the complex workings of the human heart across the streets of New York City. 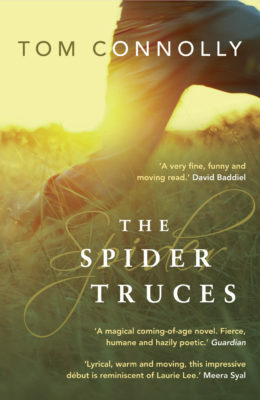 Tom Connolly is also the author of The Spider Truces (Myriad, 2010). Men Like Air is a super book that needs to be read – reviews will only ever be able to go so far in explaining it. It’s a book for mornings, for lunchtimes, for evenings. A book for weekdays and weekends. There is so much to it and whilst you may wish you could have spent longer seeing where the characters went, you won’t feel at a loss. 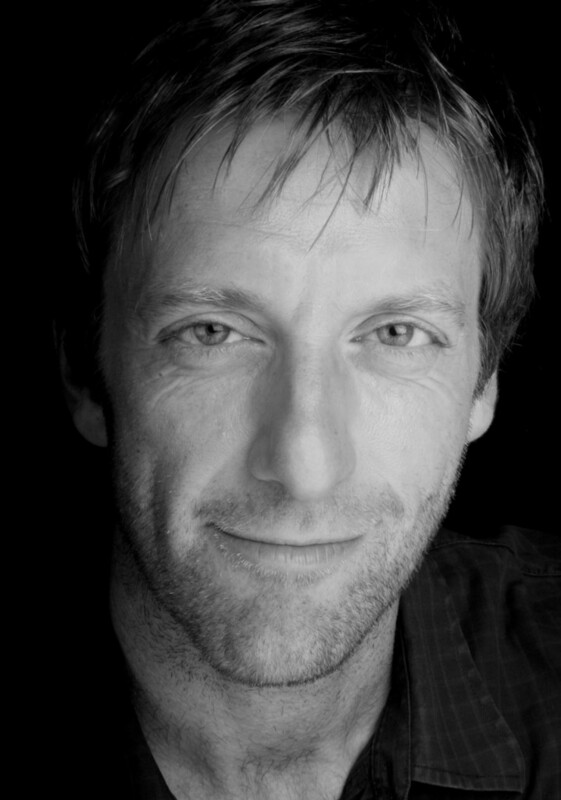 Tom Connolly is a film director and his eye for detail and precision shows at every turn of the page. The main element of Connolly’s incredible writing is how he manages to make this story into something beautiful and unforgettable... The real beauty of Men Like Air is that it is human in all its facets. Sheer bloody brilliant and for me it captivated me unlike any other book this year but in a unique way... The ultimate love letter to New York. Men Like Air is one of my books of 2016 and should not be missed. From beginning to end the writing is beautiful, witty, and sharp... Connolly orchestrates the relationships in the most assured manner imaginable, making the most of every scene and sentence. It’s funny, frustrating, upsetting, and very true to life. It’s a contender for book of the year. Men Like Air is not only thought-provoking and moving but also has some extremely funny moments... guaranteed to make you laugh out loud and worth the price of the ticket on its own. There are just wonderful turns of phrase that capture the feel of the city and the nuances of everyday life, at which Tom Connolly excels. You can tell that he is not only an author, but also a film maker, his prose has a very visual quality to it. A tender and moving read, it works incredibly well as a conversation about Men, and what makes them tick. Adding to that a layer of clever comedy, at times witty and at times almost slapstick, which combined with the deep emotions and tenderness of the main plot, leads to a book that had me crying with laughter one moment, and close to tears of sadness the next... Decisions these characters make provide fantastic moments throughout the book, and the air of unpredictability throughout is both charming and engaging – making this a must read book. The ‘love letter to New York’ may have been the hook for me but male friendship is an unusual theme which gives Connolly’s novel an added draw. Finn hops on a plane from London to New York City with girlfriend Dilly, looking forward to seeing the sights but most importantly to maybe finding his older brother, Jack, who looked after him as a child. When he meets Jack, the man is coming down with the flu and Dilly decides she doesn’t want to stay in what she feels is an underwhelming place, so they move on. In due course, Finn will find himself employed at a swanky art gallery after stealing money from a location in front of it – Leo, the owner, will be impressed by his guts and the idea of having someone so unsuited to the art world in their sphere. And the man Leo used to meet for breakfast everyday, brother-in-law William, will continue being content, nay, happy, with his simple routine. Men Like Air is a book that uses stereotypes unashamedly in order to do what it wants to do. It’s all about character and is a whole lot of fun. In many ways, then, the book is a parody. The quick ending sports a brief forward-flash of what will happen in a way that mimics the ending of Mansfield Park – yes, two very different books that nevertheless share something specific. The time spent on the characters, making them real, is matched by the time having a laugh and doing things that reminds you they are fictional. Connolly uses a lot of devices to good effect – the extreme personalities, the use of female characters as supporting roles, the use of a past year when the present would have been fine, scenes that don’t do much to push the narrative forward. One could say it’s literary fiction that bridges the gap – literary fiction that those who don’t like literary fiction will enjoy just as much as those who do, even more so, perhaps. 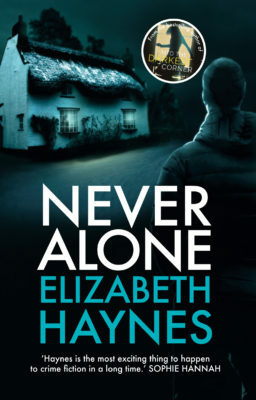 Coming to the narration, then, it’s third person past tense and moves back and forth between the characters with often a mere single linked sentence – if you’re not on the ball you may have to backtrack when you realise the point of view has changed. It’s the sort of narrative choice that can come under fire but with all the comedy and intentional extremes it’s easy to view it as another carefully considered device. Connolly often details, briefly, the situation of strangers who pass by the characters, adding to the comedy, but ‘briefly’ is the word – it’s quick, stopping before the time you’d get bored of the idea of a detour. 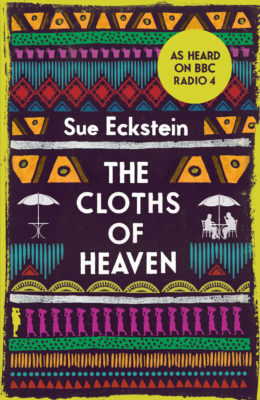 This is, as the summary says, a book about male relationships, but for all the comedy, parody, and simple delight of the work, it can seem a subtle one. In many ways it’s a book about the self. Is it very ‘manly’? Yes, but as said above, whilst the woman support, supporting is a device. There is often a female aspect at work, for example standing up to sexism, even whilst in the first chapters the worrier know-it-all whirlwind that is Dilly may make you want to stop reading (another feeling Connolly has created and knows when to stop – he’s quite the master of this sort of storytelling). It is difficult to say exactly why this book is so good. It moves slowly through the days (if you ever forget that there is Jack’s continuing flu to remind you), slowly through everyday routine. You feel you’re learning something or being told something without being able to pinpoint exactly what. Things that suggest it would be boring. But it’s not. It takes time but it makes you smile, it steeps you in New York without really exploring it or detailing much about it (one assumes many of the locations – restaurants, galleries – are fictional), it allows you to laugh at it as well as with it. Throughout you can see the author considering his reader and, much like he has his characters, he’s considered many different types of reader rather than the idea of a whole. 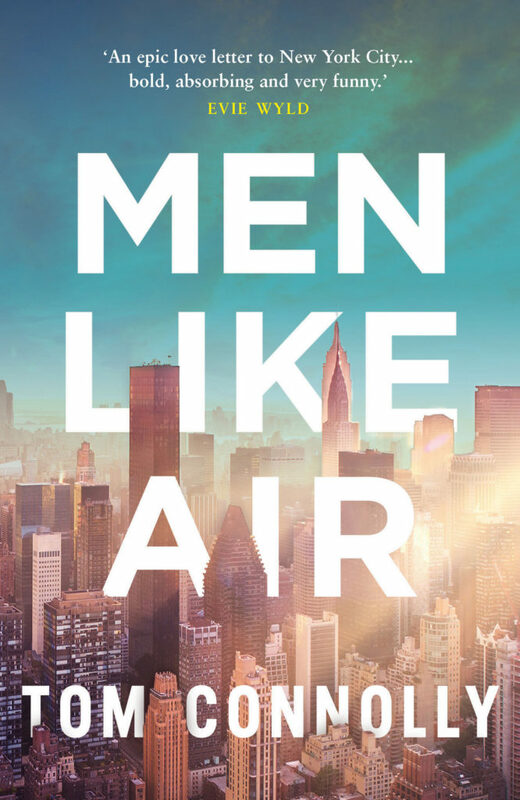 As Wyld’s blurb continues, “…bold, absorbing and very funny.” Men Like Air is a super book that needs to be read – reviews will only ever be able to go so far in explaining it. It’s a book for mornings, for lunchtimes, for evenings. A book for weekdays and weekends. There is so much to it and whilst you may wish you could have spent longer seeing where the characters went, you won’t feel at a loss. It is Springtime in New York and destiny is about to come calling for a group of men, they don’t actually know this yet but it is coming. Finn is 19 years-old and has just arrived in the city with Dilly his girlfriend who is something of a character both leaving behind a previous life, running away perhaps. Just they are not quite sure where they are about to stay. Men Like Air could well be the ultimate love story but things don’t always go to plan as in life. Dilly is one key character in this young couple and she is full of passion at the very start of this novel, but soon the story has a twist in store for the reader. The main element of Connolly’s incredible writing is how he manages to make this story into something beautiful and unforgettable. Just watch how the story becomes about four men, four lost men. For Jack the reason he is here is because he has to seek out Jack his brother following the death of their parents Jack abandoned Finn soon after. This is more or less about men’s relationships with each other. Along the way we meet other men such as Leo who runs a gallery and suffers great loneliness and seems to be in the shadow of his brother-in-law William who is everything that Leo isn’t. The connection between these two men really is all about how men handle relationships with each other. Something happens out of the ordinary that will shape and change the lives of the men involved. This is everything you want in a pure novel sense, at times full of emotion and tender as well as being funny. The real beauty of Men Like Air is that it is human in all its facets. Sheer bloody brilliant and for me it captivated me unlike any other book this year but in a unique way. Connolly’s writing is rich in the way he writes in the characters and just how he has managed to play with the emotions of the reader laughing one moment and almost in crying the next. The ultimate love letter to New York. Men Like Air is one of my books of 2016 and should not be missed. Men Like Air might begin like a clichéd modern love story, but it doesn’t stay that way for long. In fact, by beginning with two young lovers entering New York City on a bus, both seemingly escaping something horrible in their previous lives, Tom Connolly almost seems to be tricking us into expecting something standard and predictable. We might not mind the feeling of a tale well told too much, though, because from beginning to end the writing is beautiful, witty, and sharp. Dilly, the young women in that New York bound couple, is such a captivating and recognisable character in the early chapters that you might well believe this work will have her at its very centre. But once again, that expectation is pushed aside. And it is when Dilly disappears from the main thrust of the narrative that we begin to see what this work is really about. Finn, her boyfriend, is one of four lost men that actually make this novel so involving. He has come to America not to make a new life with Dilly, but to confront Jack – the brother who left him behind following the tragic death of their parents. Finn and Jack’s reunion is integral to this exploration of male relationships and psychology, and it is touching to see how their turbulent existence so far both keeps them apart and then brings them back together. Equally important to the novel’s purpose are Leo and William. Two long-time friends reaching the latter stages of their lives seem to cope better with the awkwardness that can be central to close male relationships, but in many ways that is only because they’ve become better at hiding it. Their importance to each other often goes unsaid, making the culmination of this work all the more emotional. There is a plot to this wonderful work of fiction, but in many ways it’s secondary to the characters and the way that they evolve and interact. Connolly orchestrates the relationships in the most assured manner imaginable, making the most of every scene and sentence. It’s funny, frustrating, upsetting, and very true to life. It’s a contender for book of the year. Nineteen-year-old Finn arrives in New York from England, a young man on a mission — namely, to punish his successful older brother Jack for abandoning him to an abusive uncle after their parents’ deaths. His visit is part brokered by Dilly, his crazy American girlfriend who simultaneously helps and hinders his task. Finn is befriended by Leo, a British expat and owner of a lucrative art gallery, a man beset by loneliness and envious of his brother-in-law and best friend William, a committed Christian content in his faith and marriage. Finn is that fiction staple, the stranger who rides into town and becomes the catalyst for a series of life-changing events for others. A major character is the city of New York itself; its sheer scale and noise, its sudden jumps from fabulous wealth to sordid poverty and its frenetic pace. Men Like Air is not only thought-provoking and moving but also has some extremely funny moments, the highlight being Jack and Finn’s visit to Dilly’s prosperous, self-made parents — guaranteed to make you laugh out loud and worth the price of the ticket on its own. Male friendships are under the microscope in this love letter to New York. It's springtime in Manhattan and the lives of four men collide as a series of unexpected events unfold. Funny and refreshingly complex, Men Like Air highlights the power of art and the unpredictability of cosmopolitan living. This is April in the city, the city that never sleeps, the city that is dreamy and multifaceted, loud and vibrant, never dull. Nineteen-year-old Finn flies in with his girlfriend Dilly. Where will they be staying? Certainly not in the scrubby apartment that Finn has organised. And his brother, Jack, is less than welcoming due to a severe head cold. But there is old history between the brothers following the death of both their parents. New York City is a major character in this novel, the streets and avenues cradle the lines of the narrative and it is against this backdrop that Finn begins to find his feet. The characters navigate the city, uptown, downtown, across the water, up to 10th Street and on, from the crockery and old T shirts to the canvases and installations beyond… Finn strays into Leo’s gallery and the book opens up to explore relationships that morph and meander across the grid of the city. It is a novel about friendship, art and understanding the person we might be… and of course about New York. Finn finds himself heading out from Grand Central to Queens, and descends on the New Calvary Cemetery, and turns to look back at the mountain range of brick and steel peaks called Manhattan. There are just wonderful turns of phrase that capture the feel of the city and the nuances of everyday life, at which Tom Connolly excels. You can tell that he is not only an author, but also a film maker, his prose has a very visual quality to it. One April in Manhattan, the destinies of four very different men are about to collide. Nineteen year old Finn has just arrived in the city along with his volatile girlfriend Dilly, determined to even the score with his older brother Jack for abandoning him in the UK in the aftermath of their parents' deaths. Across town, successful gallery owner Leo Emerson is haunted by loneliness, unsettled by the contrast between his life and that of his brother in law and oldest friend William, who is content in both his faith and his marriage. When Finn wanders in to Leo's gallery, a series of unexpected and interconnected events unfold, changing the lives of all four men together. I've only visited New York once, a good ten years ago now. Even then though, I was blown away by how much character the city had. It was so, so different from anywhere I'd been before, that I've had a long held urge to visit again, and don't doubt that I will do in the next few years. 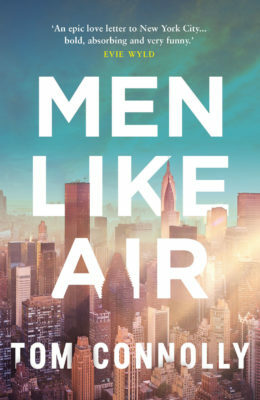 Thankfully though, through a read of Men Like Air, author Connolly successfully transported me there for a brief period, and features the city as a living, changing main character alongside the four men. This is a tender and moving read, easily reaching the core of these men and exploring their respective psyches in a probing yet gentle and respectful manner, and overall it works incredibly well as a conversation about Men, and what makes them tick. Adding to that a layer of clever comedy, at times witty and at times almost slapstick, which combined with the deep emotions and tenderness of the main plot, leads to a book that had me crying with laughter one moment, and close to tears of sadness the next – it's that powerful a read. All of the men are immensely likeable, all flawed, and all relatable – and it's genuinely a pleasure to spend a few hours in their company when reading. In fact, all of the secondary characters are very well drawn too – the only one who got on my nerves somewhat was Finn's girlfriend Dilly – and that was definitely a choice on the authors' part. Decisions these characters make provide fantastic moments throughout the book, and the air of unpredictability throughout is both charming and engaging – making this a must read book.